I am currently a sixth year graduate student working with Dr. Nancy Chanover. My research interests include instrumentation development, astrobiology, and ice giant atmospheres. My dissertation research will focus on the optimization of a two-step laser desorption time-of-flight (LD-TOF) mass spectrometer for biosignature detection and the development of statistical algorithms to be applied to several in situ biosignature detection techniques including: an LD-TOF mass spectrometer, an acousto-optic tunable filter (AOTF) IR point spectrometer, and a laser-induced breakdown spectrometer (LIBS). The identification and characterization of biosignatures in geologic samples on planetary surfaces is strongly motivated by the search for life in the solar system, which is one of the most fundamental drivers of planetary exploration. The result of this work will help determine the most effective combination of in situ detection techniques for identifying endogenic and exogenic organics within samples on other planetary surfaces. I am working with a group in the Electro-Optics Research Laboratory in the Electrical Engineering department here at NMSU to identify biosignatures within geologic samples using an IR reflectance spectrometer. The spectrometer uses AOTF technology to focus discrete frequencies of light onto a sample, which then reflects the light back onto a detector. By sweeping through a wide range of wavelengths (between 1.6 – 3.6 microns), we build a reflectance spectrum, which gives information on the absorption properties of the sample. Each mineral type has a unique spectral shape, which we use to determine the rough chemical composition of a sample. An image showing the optical path of the spectrometer (provided by Rula Tawalbeh). Light emerges from an IR source and passes through several optical components toward the AOTF crystal. The dispersion of light through the AOTF is dependent on the radio frequency supplied to the transducer. Light is then focused onto a sample and reflected off a pair of off-axis parabolic mirrors onto the detector. Although we are unable to directly measure the spectral signatures of microbes or other small critters, we can identify field markers indicating their presence. We search for evidence of local geologic anomalies consistent with biotic origin to inform other instruments, such as a mass spectrometer or a laser-induced breakdown spectroscopy system, where the most useful places to search for organics would be. This low-power prescreening method of life detection is especially useful on other planetary bodies where sample return is impractical and spacecraft resources need to be conserved. This piece of travertine is host to a microbial community. The microbes themselves are not visible, however the oxide waste they produce (dark area) is an obvious tracer indicating their presence. In 2012, the AOTF point spectrometer was paired with a miniaturized laser desorption time-of-flight mass spectrometer (LD-TOF-MS) developed by collaborators at NASA’s Goddard Space Flight Center (GSFC). The LD-TOF-MS operates by first simultaneously desorbing and ionizing a 100 μm diameter target. The resulting ions are accelerated toward the detector, which allows us to infer the mass-to-charge ratio of each ion. A two-step laser desorption/ionization time-of-flight mass spectrometer (L2MS) operates in a similar manner, however, two separate laser pulses are used for desorption (low energy IR) and ionization (UV). The desorbing laser pulse generates a neutral plume of analyte from a solid sample. After a tunable delay, the ionizing laser pulse intersects the neutral plume above the sample surface. When the laser energy exceeds a threshold value, ions are generated in the plume and accelerated into the instrument for mass analysis. This two-step desorption/ionization process preserves complex organics by reducing the degree of fragmentation of fragile biomarker molecules during the ionization process. My contribution to the optimization of a L2MS is to test the dependence of laser configuration on the degree of fragmentation using a suite of standards and analog samples on a test bed at GSFC. I will determine the ideal desorbing and ionizing laser configurations by finding the optimal laser wavelengths, timing between desorption and ionization of the neutral plume, and geometric position of the ionizing laser relative to the desorption laser. The optimized L2MS configuration will be dependent on the molecular structure of the organic sample, and in order to reduce excessive fragmentation, I will determine the optimal configuration for several sample classes including synthetic PAHs, amino acids, nucleobases, peptides, and naturally occurring organics within field samples. 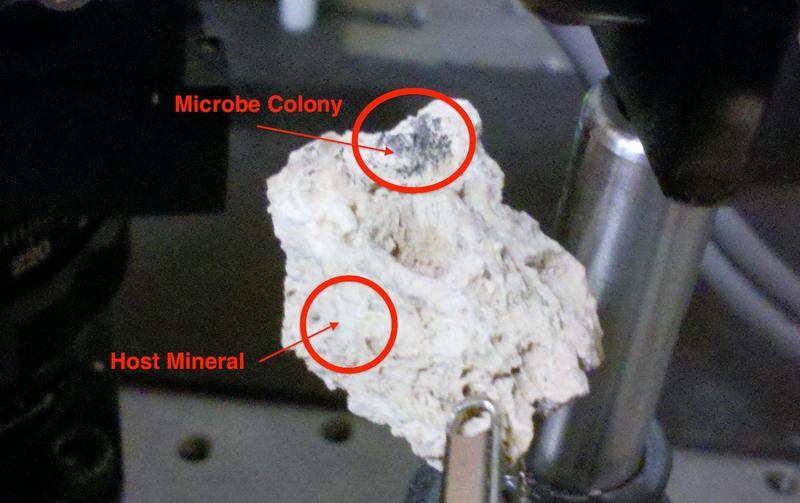 I am working with a group in the Advanced Geochemistry Research Laboratory in the Geology department to characterize the host mineralogy and identify the presence of fossilized microbes using a laser-induced breakdown spectrometer (LIBS). A LIBS instrument works by firing a laser pulse at a sample and subsequently measuring the spectrum of light emitted from the resulting plume. The emission spectrum measures the atomic constituents of a sample, and statistical algorithms (such as principal component analysis) can be applied to the data to infer the presence of microbial activity. A team at NMSU observed a stellar occultation by Neptune in July 2008 with the Astrophysical Research Consortium 3.5-meter telescope at Apache Point Observatory as shown in the animation. I fit the observed reduction of light as the star was occulted by Neptune to a simulation of an atmospheric body passing in front of a star. Among other parameters (including pressure, scale height, and atmospheric composition to name a few) the temperature of the upper stratosphere is determined from the best fit of the model to the observations. An animation depicting the stellar occultation by Neptune in July 2008. Neptune is the brightest object in the frame, followed by its moon Triton to the right of Neptune. Note: the actual duration of the event was roughly 2 hours, but has been sped up in this animation. We compared the temperature of Neptune determined in 2008 to temperatures of Neptune extracted using similar methods from occultations observed in the 1980’s just before the Voyager 2 flyby. How the temperature changes as a function of latitudinal position, altitude, pressure, and time can be used to find the most significant long-term heating mechanisms in the upper stratosphere of Neptune. The JWST is an IR space telescope with a 6.5-meter primary mirror that will orbit the L2 point after its launch in 2018. The telescope will be equipped with moving target capabilities, allowing it to track Solar System objects. Due to the large collection area of the telescope and the high sensitivity of the detectors, observing bright objects becomes a challenge. I used published IR spectra of the Ice Giants (Uranus and Neptune) to determine the capabilities of observing these bodies with the JWST. The brightnesses of these objects and the instrument and detector specifications are used to determine in which observing modes Uranus and Neptune may be observed. Their atmospheres, which are rich in hydrocarbons and display seasonally varying clouds and storms, can be probed by the JWST to examine their chemistry and thermal balance with unprecedented precision. Current ground-based observatories are unable to probe the atmospheres of ice giants to large vertical depth or with sufficient accuracy because of terrestrial atmospheric absorption and high thermal background. By calculating the expected SNR for these example observations, future observers will be better prepared to observe the Ice Giants without damaging the sensitive IR detectors. The observatory located atop Tortugas Mountain just 2.5 miles East of campus was used extensively from 1967 until about 1999. The dome houses a 24″ Cassegrain reflector, which was primarily used to observe Solar System objects, including the Shoemaker-Levy 9 impact during its original operational period. Funding from the American Association of Variable Star Observers allowed restoration of the observatory to begin, with the ultimate goal of robotizing the observatory to monitor variable stars in conjunction with other observatories located around the world. My role in the revitalization of TMO has primarily been the configuration and testing of software on-site before we begin efforts to observe robotically. I received my B. S. degree in June 2010 from the Honors Tutorial College at Ohio University. During my undergraduate studies I pursued several research interests including: the orbital dynamics of near-Earth asteroids (with Dr. Thomas Statler), the impact cratering process and resulting stratigraphy (with Dr. Keith Milam), and the properties of semiconducting thin films at high temperatures (with Dr. Martin Kordesch). I worked with Dr. Thomas Statler to model the rotation of near Earth asteroids (NEAs) due to the YORP effect (a lower-order effect which attempts to explain changes in the rotation of small Solar System objects due to variations in albedo and size). I observed and tracked the orbital patterns of NEAs with the MDM observatory 1.3-meter McGraw-Hill Telescope at Kitt Peak, and modeled the effect of radiation recoil due to thermal conductivity and total insolation at the surface. I used a one-dimensional heat equation as a basis for the conduction model, and employed a multi-dimensional Newton-Raphson iterative technique in my calculations. My senior thesis project involved taking high-temperature conductivity and Hall Effect measurements of semiconducting thin films and glass samples with Dr. Martin Kordesch, to study the conductivity, mobility, and carrier type in transition metal oxides used in thermionic cathodes. I designed and built an apparatus that can withstand temperatures of up to 500C, while still allowing a strong magnetic field to be incident across a sample. As a part of this project, I discovered first-hand a large gap between theory and experimentation and the benefits of developing an experiment with minimal complexity. My initial project design needed to be seriously modified due to complications I encountered during construction involving material strength, melting points, and significant magnetic susceptibility caused by impurities. These experiences helped me to better connect theoretical and experimental physics. IR Resonance Enhanced Organic Detection with a Two-Step Laser Desorption Time-of-Flight Mass Spectrometer. The Characterization of Biosignatures in Cave Samples using a suite of in situ Instrument Techniques I: Calcium Carbonate. The Characterization of Biosignatures in Cave Samples using a suite of in situ Instrument Techniques II: Gypsum, Mn Oxide, & Sulfur. Demonstration of a portable AOTF IR spectrometer for in situ exploration of planetary surfaces..
K. Uckert, N. J. Chanover, D. G. Voelz, X. Xiao, P. J. Boston, and D. A. Glenar. Aerospace Conference, 2015 IEEE, pp.1-9, 7-14 March 2014. Analysis of aqueous environments by laser desorption/ionization time-of-flight mass spectrometry. X. Li, K. Uckert, S. Getty, A. Grubisic, W. Brinckerhoff, T. Cornish, S. Ecelberger, and N. Chanover. Aerospace Conference, 2015 IEEE, pp.1-10, 7-14 March 2014. An investigation of the temperature variations in Neptune’s upper stratosphere including a July 2008 stellar occultation event. K. Uckert, N. J. Chanover, C. Olkin, L. Young, H. B. Hammel, C. F. Miller, and J. Bauer. Icarus, 232: 22-33, March 2014. A Comparative Study of in Situ Biosignature Detection Spectroscopy Techniques on Planetary Surfaces. K. Uckert, N. J. Chanover, S. Getty, W. B. Brinckerhoff, X. Li, M. Floyd, D. G. Voelz, X. Xiao, R. Tawalbeh, N. McMillan, A. Chavez, P. Boston, D. A. Glenar, S. Ecelberger, and T. Cornish. Aerospace Conference, 2014 IEEE, pp.1-12, 1-8 March 2014. Design of a Low Cost Mission to the Neptunian System. F. Alibay, P. Fernandes, R. McGranaghan, J. Leonard, R. Clegg, P. Craig, M. Day, N. GFougere, Z. Girazian, S. Hosseini, M. Hutchins, J. Scully, K. Uckert, M. Malaska, A. Patthoff, P. Ries, C. Budney, and K. Mitchell. Aerospace Conference, 2014 IEEE, pp.1-19, 1-8 March 2014. Spectral mixture and chemometric algorithms applied to the identification of biosignatures on planetary surfaces. Kyle Uckert, Nancy Chanover, David Voelz, David Glenar, William Brinckerhoff, Stephanie Getty, Nancy McMillan, Penelope Boston, Xifeng Xiao, Rula Tawalbeh, and Xiang Li. Geoscience and Remote Sensing, IEEE 5th Workshop on Hyperspectral Image and Signal Processing: Evolution in Remote Sensing (WHISPERS). Accepted May 2013. Results from an integrated AOTF-LDTOF spectrometer suite for planetary surfaces. N. Chanover, D. Voelz, D. Glenar, X. Xiao, R. Tawalbeh, K. Uckert, P. Boston, S. Getty, W. Brinckerhoff, P. Mahaffy, X. Li. In Aerospace Conference, 2013 IEEE, pp.1-14, 2-9 March 2013. N. Chanover, R. Tawalbeh, D. Glenar, D. Voelz, X. Xiao, K. Uckert, P. Boston, S. Getty, W. Brinckerhoff, P. Mahaffey, T. Cornish, S. Ecelberger. In Aerospace Conference, 2012 IEEE, pp.1-10, 3-10 March 2012. WEBT multiwavelength monitoring and XMM-Newton observations of BL Lacertae in 2007-2008. Unveiling different emission components. C. M. Raiteri and 68 coauthors, including K. Uckert. A&A, 507(2): 769-779, 2009. A new activity phase of the blazar 3C 454.3. multifrequency observations by the WEBT and XMM-Newton in 2007-2008. C. M. Raiteri and 74 coauthors, including K. Uckert. A&A, 491(3): 755-766, 2008. The high activity of 3C 454.3 in autumn 2007. Monitoring by the WEBT during the AGILE detection. C. M. Raiteri and 60 coauthors, including K. Uckert. A&A, 485(2): L17-L20, 2008. Multifrequency monitoring of the blazar 0716+714 during the GASP-WEBT-AGILE campaign of 2007. M. Villata and 51 coauthors, including K. Uckert. A&A, 481(2): L79-L82, 2008. The Characterization of Biosignatures in Caves using a Suite of Instruments. K. Uckert, N. J. Chanover, S. Getty, D. G. Voelz, W. B. Brinckerhoff, N. McMillan, X. Xiao, P. J. Boston, X. Li, A. McAdam, and D. A. Glenar. In 2nd International Planetary Caves Conference, October 2015. Near-IR Reflectance Spectra in a Lava Tube Cave from a Robotic Platform. N. J. Chanover, K. Uckert, D. G. Voelz, X. Xiao, R. Hull, P. J. Boston, A. Parness, N. Abcouwer, and A. Willig. In 2nd International Planetary Caves Conference, October 2015. IR Spectroscopy and Two-Step Laser Desorption/Ionization Time-of-Flight Mass Spectrometry as a Biosignature Identification Instrument Suite. K. Uckert, S. A. Getty, N. Chanover, X. Li, W. B. Brinckerhoff, T. Cornish, D. Voelz, and X. Xiao. In Astrobiology Science Conference, June 2015. Near-IR Reflectance Spectroscopy of Biovermiculation Patterns in a Sulfuric Cave Environment. N. J. Chanover, K. Uckert, D. Voelz, X. Xiao, and P. J. Boston. In Astrobiology Science Conference, June 2015. A Demonstration of the Organic Detection Capabilities of a Two Step Laser Desorp- tion/Ionization Time-of-Flight Mass Spectrometer. K. Uckert, S. Getty, A. Grubisic, X. Li, W. Brinckerhoff, T. Cornish, N. Chanover, J. E. Elsila, and R. Zare. In the 63rd ASMS Conference on Mass Spectrometry and Allied Topics, May – June 2015. X. Li, K. Uckert, S. Getty, A. Grubisic, W. Brinckerhoff, T. Cornish, S. Ecelberger, and N. Chanover. In the 63rd ASMS Conference on Mass Spectrometry and Allied Topics, May – June 2015. Two-Step Resonance-Enhanced Desorption Laser Mass Spectrometry for In Situ Analysis of Organic-Rich Environments. S. A. Getty, X. Li, A. Grubisic, K. Uckert, T. Cornish, J. E. Elsila, M. P. Callahan, and W. B. Brinckerhoff. In 46th Lunar and Planetary Science Conference, March, 2015. A Portable AOTF IR Reflectance Point Spectrometer for In Situ Biosignature Detection. K. Uckert, N. J. Chanover, D. Voelz, X. Xiao, and P. Boston. In 46th Lunar and Planetary Science Conference, March, 2015. Time-of-Flight Mass Spectrometry for In Situ Analysis of Biosignatures at Europa. S. A. Getty, W. B. Brinckerhoff, X. Li, A. Grubisic, K. Uckert, T. Cornish, A. E. Southard, M. Balvin, J. Ferrance, J. E. Elsila, M. P. Callahan, and P. R. Mahaffy. In Workshop on the Potential for Finding Life in a Europa Plume, February, 2015. Rapid and Portable Methods for Identification of Bacterially Influenced Calcite: Application of Laser-Induced Breakdown Spectroscopy and AOTF Reflectance Spectroscopy, Fort Stanton Cave, New Mexico. N. J. McMillan, A. Chavez, N. Chanover, D. Voelz, K. Uckert, R. Tawalbeh, J. Gariano, I. Dragulin, X. Xiao, and R. Hull. In American Geophysical Union Fall Meeting, December, 2014. The Development and Field Testing of the Portable Acousto-optic Spectrometer for Astrobiology. N. J. Chanover, K. Uckert, D. Voelz, and P. Boston. In The 46th Annual Meeting of the Division for Planetary Sciences of the American Astronomical Society, November, 2014. Using IR Spectroscopy to Optimize Organic Detection with a Two-Step Laser Desorption/Ionization Time-of-Flight Mass Spectrometer. K. Uckert, N. J. Chanover, S. Getty, A. Grubisic, X. Li, W. B. Brinckerhoff, T. Cornish, D. Voelz, X. Xiao, and D. Glenar. In International Workshop on Instrumentation for Planetary Missions, November, 2014. N. J. Chanover, K. Uckert, D. Voelz, and P. Boston. In International Workshop on Instrumentation for Planetary Missions, November, 2014. A Two-Step Tandem Laser Time-of-Flight Mass Spectrometer for the In Situ Study of the Surfaces of Primitive and Icy Solar System Bodies. S. A. Getty, X. Li, T. Cornish, A. Grubisic, K. Uckert, J. Elsila, W. B. Brinckerhoff, Q. Wu, and R. N. Zare. In International Workshop on Instrumentation for Planetary Missions, November, 2014. The Identification of Biosignatures on Planetary Surfaces from in situ Techniques, Including Miniaturized Mass Spectroscopy. K. Uckert, Nancy J. Chanover, Stephanie Getty, William B. Brinckerhoff, David G. Voelz, Nancy McMillan, Xiefeng Xiao, Xiang Li, Melissa Floyd, and Penny Boston. In the 62nd ASMS Conference on Mass Spectrometry and Allied Topics, June 2014. Revealing the Universe to Our Community: NMSU’s Society of Astronomy Students’ Dedication to Public Outreach. M. Maldonado, S. Rees, A. Medina, D. Beasley, A. Campos, N. J. Chanover, K. Uckert, and J. McKeever. In the 223rd AAS Meeting of the American Astronomical Society, January 2014. Neptune and Triton: A Study in Future Exploration. M. D. Day, M. J. Malaska, S. Hosseini, F. Alibay, R. Clegg, P. L. Craig, P. A. Fernandes, N. Fougere, Z. Girazian, M. L. Hutchins, J. Leonard, R. Mcgranaghan, A. Patthoff, P. Ries, J. Scully, K. Uckert, C. Budney, and K. Mitchell. In 2013: American Geophysical Union Fall Meeting, December 2013. Using Laser Induced Breakdown Spectroscopy (LIBS), Scanning Electron Microscopy (SEM), and Acousto-Optic Tunable Filter Spectroscopy (AOTF) to Distinguish Between Bacterially and Non-bacterially Influenced Calcite And Gypsum, Fort Stanton Cave, New Mexico. A. Chavez, K. Uckert, N.J. McMillan, N. Chanover, and D. G. Voelz. In 2013 Geological Society of America Annual Meeting, October 2013. TRIDENT: Taking Remote and In-situ Data to Explore Neptune and Triton. S. Hosseini, P. Ries, P. Fernandes, M. Malaska, J. Scully, R. Clegg, A. Patthoff, F. Alibay, J. Leonard, K. Uckert, M. Day, M. Hutchins, N. Fougere, P. Craig, R. McGranaghan, Z. Girazian, K. Mitchell, and C. Budney. In the 45th Annual Meeting of the Division for Planetary Sciences of the American Astronomical Society, October 2013. An investigation of the seasonal changes of Neptune’s atmosphere via a July 2008 stellar occultation event. Kyle Uckert, N. Chanover, C. Miller, C. Olkin, L. Young, H. Hammel, J. Bauer. In the 44th Annual Meeting of the Division for Planetary Sciences of the American Astronomical Society: Jovian Planets: Atmospheres and Laboratory Measurements, October 2012. A miniature spectrometer for the detection of organics and identification of their mineral context. Nancy J. Chanover, K. Uckert, D. Glenar, D. Voelz, X. Xiao, R. Tawalbeh, P. Boston, S. Getty, W. Brinckerhoff, P. Mahaffy. In the 44th Annual Meeting of the Division for Planetary Sciences of the American Astronomical Society: Future Missions and Instruments, October 2012. A miniature spectrometer for detection of organics and identification of their mineral context. Nancy J. Chanover, David A. Glenar, Kyle Uckert, David G. Voelz, Xifeng Xiao, Rula Tawalbeh, Penelope Boston, William Brinckerhoff, Stephanie Getty, and Paul Mahaffy. In International Workshop on Instrumentation for Planetary Missions, October 2012. Laser time-of-flight mass spectrometry for future in situ planetary missions. S. A. Getty, W. B. Brincker-hoff, T. Cornish, S. A. Ecelberger, X. Li, M. A. Merrill-Floyd, N. Chanover, K. Uckert, D. Voelz, X. Xiao, R. Tawalbeh, D. Glenar, J. E. Elsil, and M. Callahan. In International Workshop on Instrumentation for Planetary Missions, October 2012. A miniature AOTF-LDTOF spectrometer suite for the detection of biomarkers on planetary surfaces. Kyle Uckert, Nancy J. Chanover, David A. Glenar, David G. Voelz, Xifeng Xiao, Rula Tawalbeh, Penelope Boston, William Brinckerhoff, Stephanie Getty, M. A. Merril-Floyd, and Paul Mahaffy. In Astrobiology Science Conference 2012 Exploring Life: Past, Present, Near and Far, April 2012. Kyle Uckert, Nancy J. Chanover, David A. Glenar, David G. Voelz, Xifeng Xiao, Rula Tawalbeh, Penelope Boston, William Brinckerhoff, Stephanie Getty, and Paul Mahaffy. In Life Detection in Extraterrestrial Samples, February 2012. Dean C. Hines, Kyle Uckert, Nancy Chanover, and Heidi B. Hammel. James Webb Space Telescope: Science Operations Design Reference Mission: Solar System, Revision: C. ID: 92050, pp. B-12 – B14. December 2011. Rapid assessment of high value samples: A miniature AOTF-LDTOF spectrometer suite for cave environments. N. J. Chanover, D. A. Glenar, D. G. Voelz, X. Xiao, R. Tawalbeh, K. Uckert, P. Boston, W. Brinckerhoff, S. Getty, and P. Mahaffy. In First International Planetary Cave Research Workshop, October 2011. Using the James Webb Space Telescope to study Ice Giant atmospheres. K. Uckert, N. Chanover, H.B. Hammel, and D.C. Hines. In EPSC-DPS Joint Meeting 2011: Future Planetary Missions and Instrumentation, October 2011. Planetary Surface Processes Field School. Centre for Planetary Science and Exploration: Western University, London, Ontario, Canada. May 12–22, 2015. I participated in a field school located in northern Arizona and southern Utah, where I was introduced to processes that shape the surface of the Earth and other terrestrial planets, specifically volcanism, impact cratering, tectonics, and fluvial and aeolian erosion. Workshop on the Habitability of Icy Worlds. Pasadena, California. February 5 – 7, 2014. JPL Planetary Science Summer School. Pasadena, California. August 12 – 16, 2013. During this intensive week, our group, consisting of 16 scientists and engineers, designed a flyby spacecraft mission to Neptune. My primary leadership roles were: atmospheric science lead and mechanical structures & configuration chair. Portable DEO-Nano Board FPGA Sensor System Workshop. Las Cruces, New Mexico. June 7 – 8, 2012. First International Planetary Caves Workshop: Implications for Astrobiology, Climate, Detection, and Exploration. Carlsbad, New Mexico. October 25 – 28, 2011. Frontier Science Opportunities with the James Webb Space Telescope. STScI, Baltimore, Maryland. June 6 – 11, 2011.